“Did you want to ask me something?” She turned to him, as if taken aback, wide-eyed and oh so innocent, hair swishing against his shoulder, silken soft. He resisted the urge to give her a pat on the head, to reassure her. “Why do you always appear at this time of the day?” She tucked her hand in his and squeezed, maybe she could keep him from leaving. Don't worry, we'll meet again. He wanted to whisper those words in her ear, to tell her all he knew, all she would come to know. But there were rules, and he would be breaking them. And what would that lead to? What if he never saw her again? She was not at all satisfied, brows furrowed, nibbling at her lower lip in concentration. She desperately wanted to pry but wouldn't – it was so familiar, it burned. “Do you know which school you will be attending come next year?” He sighed, setting his hand across her back, holding her loosely but with enough security. I won't let you fall, don't be scared. 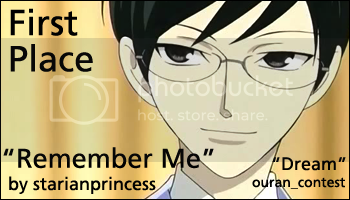 “I think I want to apply at Ouran High School,” she answered after a moment's pause, her tone hard (yet so easy to break, he noted), her eyes shining with a kind of hope which he knew she would carry forever. He smiled, one full of shadows and doubts and fears; she noticed. The clock hanging above them chimed – it was time to go. Already, he could feel his legs disappearing, the room swirling in a pool of nothingness. “Don't go,” she pleaded, her hand clutching on to his shirt. She was all that he could see. But he closed his eyes, opened them again, touched her shoulder, a light feathery touch – she let go. “Will you remember me?” He asked, just as he always did. And she nodded with a forceful kind of sadness, unwilling to believe anything else. And then he was gone, no fairy dust, no gust of stray wind, no nothing. As if he had never existed. And in time, she did forget. And so did he. Kyouya stirred, reaching for his glasses, sitting up, staring at the desk in front of him. Tamaki looked down at him, worried, hand on his shoulder.